여기서 살펴볼 주제는 콜센터와 관련된 내용이다. 오늘 국내 VoIP Solution 장비업체 사장님을 만나서 여러 가지 이야기를 나누었는데, 국내 시장에서 Enterprise쪽, 특히 공공 분야에서 VoIP를 도입하는 사례가 점차 많아지는 추세라고 한다. 기업 또는 공공기관에서 IP PBX를 도입해서 IP Call Center도 구축하고, 기업내 통신을 VoIP로 바꾸는 작업이 활발하게 진행되고 있는데.. Skype를 이용해서 기존 Call Center와 동일한 기능을 제공할 수 있다고 해서 살펴보고자 한다. 비즈니스용 스카이프 엑스트라에도 등록되어 있는 솔루션인데.. 그 기능에 대해서 잠시 살펴보자. 이 솔루션이 기본적으로 제공하는 기능 및 특징은 다음과 같다. The intelligent routing involves not only the responder's skill set but also his/her current availability. Business rules, queue management and Instant Messaging play a large role in the ACD solution. If chat is involved, OnState's ACD provides a web-based chat window for the non-Skype caller. Multimedia - As part of the Skype solution set, the OnState ACD for Skype supports a multitude of media types, including, voice, video, chat, click-to-call, web call-back, IM, conferencing and SMS. Business-Rules Routing - The OnState ACD for Skype solution begins with mapping-out your customer service business rules, and then ensuring that they are consistently applied and adapted in real-time to changing conditions. The OnState Rules Engine allows you to define who your customers are, determine exactly what they are requesting, and to select the best resource or course of action to deliver on that request. Skills-based Routing - You can define the specific skills and proficiencies of each of your employees and use that information to fine tune who handles which specific customer request. Customer/Market Segmentation - Who is Calling and Why? The business Rules Engine allows you to determine who is attempting to contact you and what they are looking for. Use this feature to ensure that your most important customers/prospects (they are all important, just some more than others) are given priority. Give added emphasis to sales inquiries as opposed to status updates. It's your call. Easily customized - OnState ACD for Skype has been built from the ground-up to be a 100% web-based communications application. All application configuration and logic is stored in industry standard XML. User Interfaces are constructed utilizing AJAX and OpenLaslo. It comes ready to use right out of the box, or you can choose to customize it for your specific needs. Multi-protocol - Supported communication protocols include Skype, SIP and XMPP. Seamless Application Integration - OnState ACD for Skype is built to be a part of your business applications, not bolted-on to them. The OnState approach to communications is to make it a part of your business processes, not a standalone element that requires complex and costly middleware for integration. Our web services interfaces allow for quick mash-ups with other business applications, such as Sales Force Automation (SFA) and Customer Relationship Management (CRM). Pending Communications - Life is hectic, schedules change. Let OnState monitor both parties' status and establish the call when both you and your customer are ready. OnState's Pending Communications allows you to automatically schedule a callback based on both parties realtime availability. Reporting and Analytics - Comprehensive real-time and historical statistical information. Know precisely who is contacting you, how long they have been waiting and what resources you have available. Collect and report on all of the details regarding your customers interactions with you. Presence Enabled - Let your presence be known. Be more than just a phone #. Publish your business' presence to your customers, letting them know that you are ready to serve them, and be aware of your customers' availability to speak or chat with you. 이 솔루션은 기본적으로 Skype-to-Skype 통화를 기본으로 한다. 고객이 Skype계정을 가지고 있지 않은 경우 아래와 같은 두 가지 방법을 통해 콜센터에 연결할 수 있다. 웹페이지의 Click to Call 버튼을 눌러서 고객의 PSTN 번호를 남겨 놓는 방법. 고객이 남긴 번호는 Que에 저장되어 적당한 상담자에게 할당되며, 자동으로 전화를 걸어준다고 한다. 상담원의 SkypeIn 번호를 알아서 PSTN에서 직접 전화하는 방법. 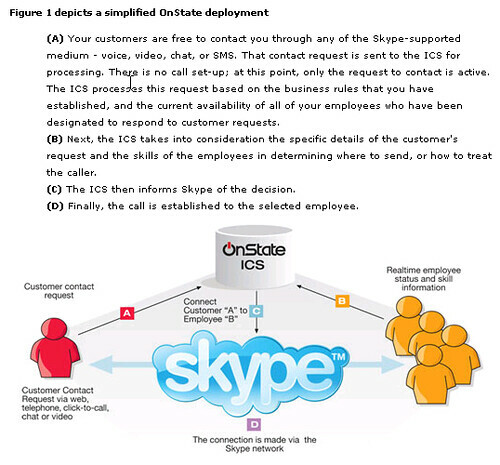 On-State ACD for Skype3.0 사이트에 Click-to-Call 버튼이 있는데, 눌러 보시면 대충 어떻게 동작하는지 알 수 있을 것이다. 가격이 문제인데.. 현재 상담원 한 명당 29.95불/월의 사용료를 내야 한다고 한다. 무료 체험할 수 있는 버전을 제공한다고 하니 관심 있으신 분은 신청해 보시고, On-State 페이지에 있는 데모도 참고하시기 바란다. 대형 콜센터를 이것으로 대체하기에는 뭔가 부족한 것 같고, 중소 규모 업체에서 이용해 볼만하다는 느낌이 든다. 데모에서 봤을 때 고객 및 상담원 측에 상대방이 Contacts로 등록되는 것으로 보이는데.. 고객 입장에서 보면 Privacy가 문제가 될 수도 있을 듯 하다. 다만, 국내 사업자가 이용하기에는 언어/기술지원 등의 문제가 있을 것으로 예상되는데.. 한국 스카이프에서 이런 부분에 대해서는 마케팅 계획이 있는지 궁금하다.